I have decided – reluctantly but firmly – that this is hilarious. The Tory right, having sabotaged Britain for their bitter ideology are now destroying their own party. Oh sweet karma. Alpha Oaf Boris has zip-wired into such chaos that even a battery of ridiculous photo opportunities can’t save him, and we the Great British People are left with a cluster of candidates so loathsome and useless to stretch credulity. One of this staggering brood will lead this party into electoral demise. 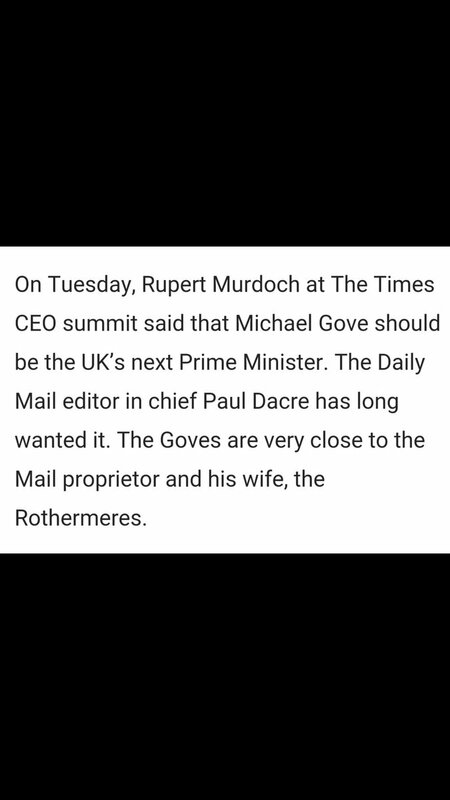 We can only speculate about the real reasons behind Boris Johnson’s decision to withdraw from the Tory leadership contest, though the very closeness between Sarah Vine, the Daily Mail and Rupert Murdoch should give us a clue. In England in 2016 that’s what Taking Back Control really looks like. Theresa May, the woman who brought you the Home Office Hate Van, and the Telegraph is calling a ‘steady hand on the tiller’ is like a Thatcher cadaver with prada heels. She is we’re told the current front-runner. In such days of madness Theresa May is the moderate unifying candidate. Just when you thought that the Farage Contagion had been isolated it breaks out in new human form. 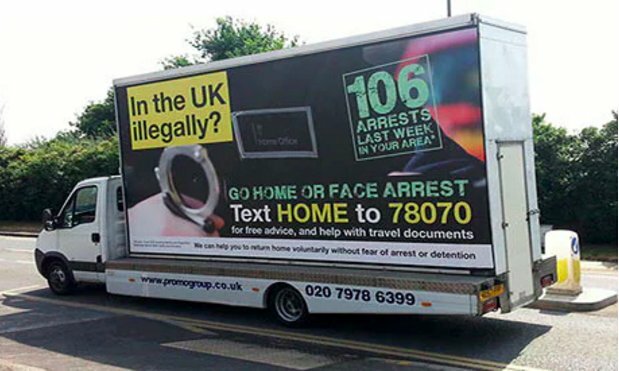 For those of you who think that the current levels of xenophobia appear out of nowhere, May’s track record on immigration and human rights is appalling. Yesterday the Times Sam Coates reported that May has “thrown into the mix the right of EU migrants currently in UK to stay here”, saying that negotiation with EU will determine this. She was also responsible earlier this year for the deportation of thousands of foreign students. This was a fiasco which led to a parliamentary investigation after an immigration tribunal ruled that the Home Office used unscientific “hearsay” to deport thousands of students from Britain. “I am an inconceivable choice as party leader” (to the Sunday Times in 2013). Liam Fox or “the disgraced former defence secretary, Dr Liam Fox” to give him his full title was forced to resign from the Cabinet in disgrace. You may have forgotten all this, his slow rehabilitation has been creeping along these past few years. He was Defence Secretary and somehow allowed his close friend and best man, Adam Werrity, to take up an unofficial and undeclared role to attended meetings at the Ministry of Defence without any security clearance. Werrity had access to Fox’s diary, printed business cards announcing himself as his advisor, and even joined him at meetings with foreign dignitaries. That such a recent disgraced cabinet minister, in such a senior position should slide back into public office tells you as much about British politics as it does about the candidate. “Fox is a hero to the many Conservatives who not only revere the memory of Margaret Thatcher, but also believe that unabashed Thatcherism is what is required now. They praise Fox for sounding ‘principled’ rather than ‘wishy-washy’. They laud him for being ‘a proper Eurosceptic’ who wants strict immigration controls. They love his loyalty to old friends, and deep commitment to the Anglo-American relationship. They admire him as a communicator, relish his joie de vivre.” Author Andrew Gimson, ConservativeHome. I know nothing abut Andrew Leadsom. I read that she has talked in the past of how immigration could “overwhelm” Britain, and that her brother-in-law, a banker who lives in Guernsey, has donated more than £800,000 to the Conservative party since she was elected. And Please God No it is not remotely relevant to anything in the universe that Crabb, Gove and Fox are (technically) Scottish, or that May or Leadsom is a woman. One of those people will be your next Prime Minister, not elected by the public but by 331 Conservatives MPs, most of whom have spent their last year spewing out lies about an ‘unelected and distant body’ running their country. The only potential positive to come out of this is that the Conservative Party are like a hermetically sealed body divorced from the realities of public feeling that they will elect a leadership even more toxic to Scottish public opinion that George Osborne and David Cameron. Looks like May wants the job but she wants to appoint, a numpty to press the 50 code button. Who do you think has the longest. Finger see she looked cool in the black watch suit, then they are trained and known to be able to stab you in the back. Lib Dems are enjoying a revival. Tim Farron is the only leader besides Sturgeon making the right progressive noises on EU. Lib Dem membership is increasing and they have just won a by-election with a 27% swing from Tories. Seems English Remainers are getting behind LD since Labour is in disarray. In Scotland the LD vote had all but melted away. But interestingly, in the only two constituency seats the LDs took in May, there was only a negligible rise in the Tory vote whilst in every other constituency the Tories were increasing by around 10%. I predict that Ruthie’s reign as Queen of the opposition won’t last long, as No voting Remainers will vote LD on the back of the EU vote. Interesting times in which we live. Everything is all change. Nice to know Willie Rennie has started commenting on Bella. Who are these ‘Lib Dems’ you speak of? reminds me of two minute hate. A change of tactics required? Toxic Tories, Unionist LibDems, Labour in Scotland unionist westminsterites. They do not acknowledge the Scottish vote to remain unless through the UK aka England. Closet supporters of English Votes for Everyone’s Laws. They would acquiesce in Scotland, as they have done, getting governments it did not vote for. Yes, but it is an extraordinary situation to find that Gove is only the second most creepy and extremist Scotsman offering himself up as the next Prime Minister of the U.K. and the shortly-to-be F.U.K. As for Andrea Leadsom, see as they say “Eyes passim” – serial revelations in Private Eye about conflicts of interest between her ministerial post and her personal links with the offshore finance business. The in-house candidate of the City of London. I read another piece before this one. Both are spot on. Let me recommend this article from the New Statesman. We are deep in the mire of incipient fascism; I wrote recently drawing an analogy with the rise of the Third Reich and as here we see the contenders for the Fuhrer position. Thanks for the link to the article – sobering reading but sadly not telling many of us anything surprising. Recently, Karl Marx’s dictum, “History repeats itself, first as tragedy, second as farce,” has being much quoted. I very much fear that there will be little farce and a lot more tragedy coming our way. The parallels with the rise of fascism are manifold and should be extremely disturbing to all. Our Prime Minister to be accurate, and the one who will be negotiating the new arrangements with the EU. There are some strong cards, and as the article points out this will include EU nationals in the UK (twice as many as UK nationals in the EU), borders with Ireland would be another. Weakness in the EU economy being the strongest of all, with the credit rating downgraded after Brexit. The SNP will wait and see what kind of deal the Tories get from the other member states (I can see the Commisson being sidelined on this) before any referendum decision is taken. But it would be worth doing some work on institution building even though, or because, any EU membership application will be made as a community outside the EU (and EFTA or another arrangement may be preferable if the EU isn’t reformed). There should at least be a practical taskforce – not academics – on the praticalities of setting up a central bank and currency to make an indyref2 a credible proposition. Theresa May, and the others, are running to be leader of the Tory Party – with the added bonus of being PM. This party has won 6 of the last 9 general elections; the other were won by Labour, led by Tony you-know-who. Theresa May, the favourite, should worry any anti-Tory. One of the party’s weaknesses has been the accurate claim that it was run by out-of-touch Bullingdon Boys. May is a different, more middle class, individual. For Labour, in England and Wales, this another possible disaster. It will of course depend on how she performs, if she gets the job, but a reassuring leader may (sic) be just what the Tories need – to let them continue winning elections. It is very unlikely that, as a leader, she would be more toxic in Scotland than Cameron has been. Agree SNP should certainly make preparations but there’s no way , in my mind , I can see the UK triggering article 50 . Absolutely no chance . I don’t think our continental cousins are going to give us the option not to. They’ve accepted and moved on, the rest is detail. Aye but the trouble is, as far as I can gather, that it’s not up to them, it’s up to the UK when and if article 50 is triggered ? Also it has to be voted through a parliament with no majority for Brexit ? Gove has just threatened to tear up the recently agreed fiscal framework and slash Scottish funding. Today he also claimed he understood Scotland. Hilarious, unless his plan is to rid of us. Roll on Indyref2. Just been reported that Mike Russell has had a furious reaction to Gove’s speech about rebooting the UK union and hinting at revising/abolishing the Barnett formula months after the fiscal framework was agreed after much bitter rankling. We have no security or autonomy within this sordid union. When will No voters realise en masse? Then there needs to be a Plan B from the SNP (or Yes Scotland if it can be reformed). One that’s not dependent on the whims of London or Madrid. It is now almost 2 years since the failed independence referendum, lessons have hopefully been learned ? We need to have in place, all those national structures, ie. central bank, currency, land value tax etc. so that when it is deemed the ‘right time’ to hold indyref 2, the population will already be convinced that we can prosper as an independent country ! I voted YES in 1979, and in 2014, and will vote YES the next time, but the snp, along with the greens, and Scottish labour ( if they ever wake up ? ) have got to prove the finances add up, and work together for this. Don’t talk down to us, just give us a simple and unequivocal answer, that cannot be sneered/smeared at by the self serving westminster elite. Do that, and we will win the next referendum comfortably. Has anybody noticed the likeness between Gove and those foul mouthed ventrioloquits’ dummies? Well his wife does have her hand up his arse telling him what to do. So that means if Gove wins the UK will be ran by a columnist from the Daily Heil. Not much change then. Ah well, Engerland’s beligerance is Ireland, France and Germany’s opportunity as Dublin, Paris and Frankfurt eye up financial service jobs in London. And eye them up they will and from Edinburgh too! Thank fk they forced the Language on the potato people and split the country , means call centre lunchtime will be less sweet chai and more of the black stuff. Offshoring jobs only protects the wealth of a few stock holders in banks , and removes that secondary income from a nations GDP , so I suspect Belfast would be preferred with lower wages… to god forbid Englishburgh , sorry oor capital…. well mostly and for the time being. Symbolism of am freiceadan dubh (Black Watch) tartan, not missed at Theresa May’s launch. However, it’s important to make clear that she is in no way related to Stevie May, ex of St Johnstone. Just as an aside, have you seen the Charlie Hebdo ‘Brexit’ cover. England, finally masters in their own house. Things are moving quickly. May’s early lead in the race was deceiving, she is not a Brexiteer and she lacks charisma, she has no rapport with voters and all she is offering is competence. The Tory Party has never been known for stupidity, they will reject May as a vote loser and plumb for Andrea Leadsom instead. She is already picking up support at a faster rate than May. She’ll be chosen because she can be relied on to deliver the fully monty on Brexit and is personable in a way May isn’t and is not seen as a vote loser. What we know about Leadsom is that she is not interested in staying in the single market, she’s made this clear on a number of occasions. She is also a diehard Thatcherite. So if the SNP are waiting to see what happens first before they decide on indyref2 they need to be ready to go because Leadsom will not provide any reason for putting it off. I doubt a Leadsom Government would grant it. She might even welcome the howls of objection in Scotland and even from abroad, she’ll she it as her Falkland’s moment, when she’s able to show that Blighty is no longer going to be pushed about by the Jocks or foreigners. What would we do then? My suggestion would be a long drawn out extra-parliamentary campaign that shows that we don’t accept the legitimacy of Leadsom’s Government. This will be her Achilles heel. The Tories have decided against holding an early election because they know they would lose their slim majority if they did. Moderators any chance of articles on the way ahead if as seems very likely a referendum is blocked by the UK government. That sounds a bit hollow given that she said to Brewer that it must be held within the timeframe that allows Scotland to retain it’s membership of the EU. It obvious that the BBC and the press are already engaged in project fear 2, their aim is obvious, put most Scots off having a second referendum. The opinion polls will record a majority against another referendum and the new Tory Leader will cast herself as the Scottish people’s champion by telling Sturgeon that there is no popular support for indyref2 she won’t block it unless Sturgeon persists but if Sturgeon put a referendum forward she will and even Leadsom didn’t there is no majority in the House of Commons or the Lords for allowing it. Theresa May offering competence? That would be a vast improvement on what she’s given us as Home Secretary. I didn’t realise just how useless she has been as home secretary till I saw on twitter just now that her campaign team have got the Telegraph to pull an article they were going to publish today that would have detailed just how incompetent she has been. That will be the usual suspects demonstrating in Glasgow and Edinburgh; the ones that the BBC ignore and do not report. Londoners will not protest and that is the only place where protest is taken note of. Even then it is misreported and minimised by Main Stream Media unless it turns into a full scale riot. Regardless of who gets the throne we need to be working now to be ready for Indyref2. You’re right. That’s why I made the suggestion to Mike that it would be good to have articles exploring the options when Westminster inevitably says no. One of the worst things would be to just leave it all to politicians. Your point about London demos being the only demos that get reported shows the importance of anchoring our struggle in the context of a UK wide struggle where Scotland’s resistance to Brexit is seen as part of a wider struggle against the post Brexit revamped Thatcherite establishment. Alyn Smith’s address to the EU Parliament avoided the trap of seeing this as just about Scotland, he said many in England and Wales did not vote for Brexit and his speech was seen in England as part of their struggle against the likes of Farage and the Tory right. So we have us to continue to make common cause with people in London and the other places that voted remain. If those remain supporters outside Scotland see indy as one of the many battle fronts against this new Thatcherite order they might well come out and demo in support of the Scottish people’s right to decide their own future. The msm and Scotland same old project condescension starting up. It is not fear, it is driven by condescension and scorn. Better Together is becoming a black comedy. The Scottish branches of the English parties are in a fix. Powerless in the face of head office infighting, mete onlookers mouthing the old mantras – broad shoulders, pulling and sharing, the crown, the war…..
Fog in the Channel!! The Continent cut off. One could predict the Labour party in Scotland will be the first of the westminsterite parties to move to independence for Scotland. They could get their party back? Their craven lingering for the Union had been their sudden and dramatic collapse. If they want a social Scotland, then they will not achieve that in the Union. EVEL had put laid to that. Sorry, hopefully this is Andrea Leadsom on the single market. I listened to the first half of the interview and that was enough. She does not seem quick enough on the uptake to get through the process. Maybe it’s just her TV style but the impression given is that things would pass her by. Before the EU referendum she spouted the Farage rubbish without a blush; would she still stick with the nasty foreigner stealing all our houses and jobs story now we are signed up to leave. I’m only going with what’s coming out of the MSM and the bookies, who have slashed the odds on Leadsom in the last 24 hours. The reason seems to be because there is a growing realisation amongst Brexiteer MPs that May will sell out and accept free movement of people because of the economic consequences of leaving the single market. If the Brexiteer MPs can unite around a candidate they think the membership will identify with, then the Brexiteer candidate will win because the membership will pick the candidate who won’t reverse the Leave vote by accepting a Norway style agreement. Plus the impression I’m getting is that leave voters don’t see her as slow but instead as calm, unruffled and determined and they indentified with her rather than Boris in the debates. The Tories want a Farage lite leader because they are aware that UKIP still poses an electoral threat. Personally, I think the Tories will lose a lot of remain supporters who previously voted Tory, because things haven’t gone to script. They assumed after the vote that the British way would prevail and people would say fair play and accept the vote, but that hasn’t happened, people still feel traumatised. We’re still getting articles in newspapers saying that the Leave campaign will never be forgiven for what they’ve done. I looked at some more youtube footage. I’m not sure if it’s slow on the uptake that’s the problem, more that she doesn’t convey any great energy or dynamism. None of the Tory contenders are better performers than Cameron, which shows that it’s been a disaster for the Tory Party as well as for the country, not that the Brexiteers are bothered. Good article. Fix the typos. Having marched yesterday in London, I think there will be a fudge on brexit. There will be no triggering of article 50 in the foreseeable future, the tories will string it out to the point where two options exist and that will be put to the uk or ruk. Currently the uk looks a complete joke, a nasty bitter and twisted joke. No wonder many bt’s are crossing over to yes. Scotland needs to rise above this uncertainty and form our own plans and alliances with independence being the key oblective. An alternative to the Tories/Westminster’s undemocratic rejection of an Indyref2, with the latter first sanctioned by a Holyrood vote, would surely be UDI. Nicola has 56 ‘aces’ up her sleeve in Westminister (a Scotland majority) to help deliver that alternative (or are they jokers?). Re our ‘next Prime Minister’ being one of these Conservatives, I would not bet on it. That depends on them not holding a General Election. Given the turmoil currently, Tories may either be unwilling to do so – knowing their own party’s internal divisions – or may think the Parliamentary Labour Party’s self-butchery provides an ideal opportunity to do so. However if Jeremy Corbyn stays Labour leader, as he has declared he intends and as I hope, I would not rule out a General Election returning either a hung Parliament or even a Labour majority – things seem that fluid and turbulent. This possibility may depend significantly on the Chilcot Report and how JC publicly handles its conclusions on the Blair government. If he were to act decisively, in accord with a putative strongly-anti-Blair outcome of Chilcot, could that earn enough popular support for a General Election win – by a purged and newly-credible Labour Party bearing aloft the standard of social justice? That would be my preferred result.